So far Iceland has had no oil industry and imports all its petroleum products (equilvalent to almost 18,000 barrels of crude oil per day). However, there are certain areas on the Icelandic continental shelf that are thought to have potential for hydrocarbon accumulations. In recent years the main focus regarding possible oil exploration within Icelandic jurisdiction has been on the Dreki Area (dreki means dragon in Icelandic). The area is part of the Jan Mayen Ridge micro-continent on the northeastern Icelandic continental shelf. 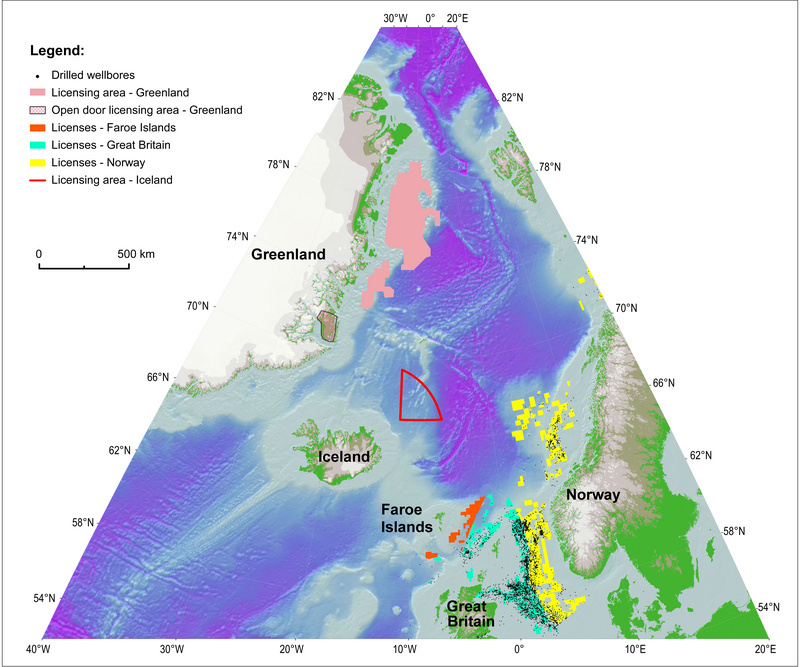 The Dreki Area has geological similarities to neighbouring hydrocarbon basins close to Greenland and Norway. Seismic surveys and other geophysical measurements indicate that oil and gas could possibly be found in the area. Hydrocarbon accumulations on the Icelandic continental shelf are owned by the Icelandic State. Licence from the Icelandic National Energy Authority (NEA) is required for prospecting, exploration and production of hydrocarbons. The legislation has provisions for two types of licences: a prospecting licence, and an exploration and production licence. Earlier this year (2012) the NEA offered blocks for exploration and production licences on the Dreki Area. The area covers 42,700 square kilometres with water depths ranging from 800 to 2,000 metres. This was Iceland’s second licensing round ;the first round in 2009 attracted no serious applicants. This time three groups of companies submitted their applications. They are (in alphabetical order) Eykon Energy (an unregistered Icelandic company), Faroe Petroleum and Íslenskt kolvetni ehf., and Valiant Petroleum and Kolvetni ehf. Íslenskt kolvetni ehf. and Kolvetni ehf. are Icelandic firms with well known Icelandic companies and businessmen as shareholders. Faroe Petroleum and Valiant Petroleum are well known exploration companies for example in the North Sea. In the media the Director General for the NEA has said that the applications this time were beyond his brightest hopes. The NEA will be evaluating the applications during the summer in accordance with the legislative criteria. Possibly we may see the first hydrocarbon exploration and production licences on the Icelandic continental shelf awarded early this autumn. In he coming weeks we will be adding more information on www.askjaenergy.org about hydrocarbon potentials in Icelandic jurisdiction.